Through Lebanese Armwrestling Championship tour 2018 in 6 regions, we arrived to step 4: the Armed Forces championship will take place on Saturday, August 4 2018 under the patronage of General Joseph Aoun and in cooperation with Dr. Talal Makdessi. This event is connected with the Lebanese Army Anniversary Day on the 1st of August. The championship will include all the kinds of armed forces - from the Army to the Internal security forces, Public security forces, State security forces, Customs forces and Firefighing forces. Each team will be represented by 10 players: 4 men over 90kg, 4 men up to 90kg, 2 women open category. 60 players will compete in 1 event to secure top qualifiers to the finals that will take place on the 9 th of September 2018 in Downtown Beirut in presence of the World Champion Andrey Pushkar. I made this step to give the opportunity to our protectors, the Lebanese armed forces to compete in a professional organized sport and have the chance to represent our country in international championships. Levan Saginashvili: I have a plan - I want to be the best in the world! Imeda Tchincharauli: "New difficulties for me are a huge motivation and I'm going to use it to achieve my goals." 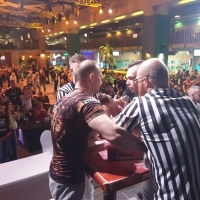 Mazurenko Armwrestling Promotion plan for Georgia is working just great! Mirtaleh Aslanov: "Zloty Tur" is a different power, different experience!